There’s always room for Jell-O, especially one as festive and fun as this Triple Layer Vintage Christmas Jell-O Salad with red, white and green layers that are perfect for Christmas dinner! Look, I know it’s not cool to like Jell-O, okay? But can we just get over our food snobbery for a second and admit that Jell-O is delicious? I know it’s retro and weird and nobody knows what food group it’s in because maybe it’s not real food and blah, blah, blah. But I say phooey to all that because honestly, it’s just yummy! 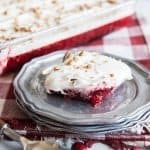 And I make this triple layer Christmas Jell-O every year, without fail, so why not share it on the blog? 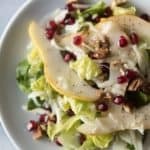 If you want a salad that is “healthier” or “more real”, I’ve got a gorgeous (and scrumptious) Winter Pear, Pomegranate & Swiss Salad with homemade poppyseed dressing that will be right up your alley. But if you, like me, have an affinity for this wobbly, wonderful weirdness that is Jell-O, then please read on after the jump! If you are still with me, bless you. We must be kindred spirits. So, this Christmas Jell-O (as we affectionately call it in my family) is so fun to make and even more fun to eat. 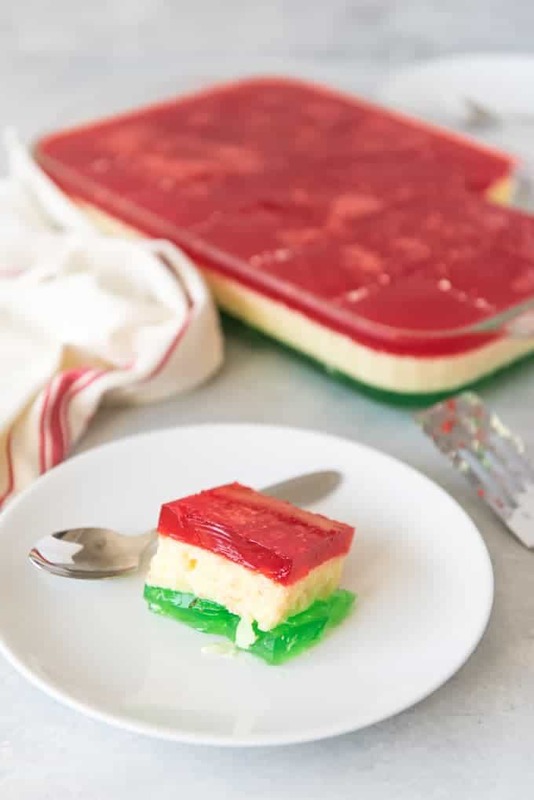 It’s three wonderful layers of flavor with a plain lime bottom layer, a plain cherry top layer, and a creamy, tangy middle layer of vintage Jell-O weirdness that is a combination of lemon Jell-O, crushed pineapple, marshmallows, cream cheese, and…wait for it…Miracle Whip. I KNOW, RIGHT?!?! It’s wild and zany but I’m just going to embrace the wackiness and confess that the middle layer is my favorite! The cream cheese adds depth and richness and the tang of the Miracle Whip actually helps cut the sweetness of the Jell-O. I know it sounds weird and maybe even awful, but it’s really not, I promise! And I really ought to stop apologizing for it because I truly do love it and haters gonna’ hate anyway, right? 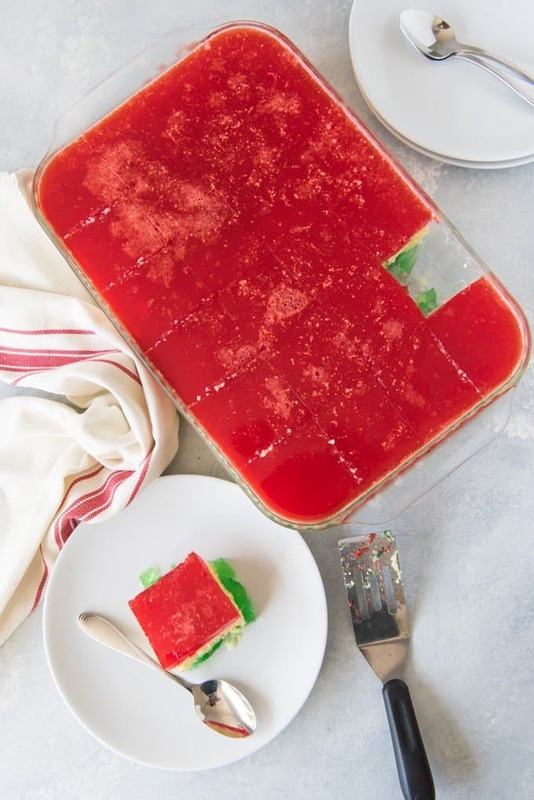 It’s like an Italian soda cherry limeade jell-o with the creamy middle and the cherry and lime top and bottom. An Italian soda cherry limemade that jiggles and isn’t really a proper salad but since it goes by that name you get to eat it with your dinner even though it probably falls more appropriately in the dessert category. So there! For reals though, it’s easy enough to make. You just prepare your bottom lime layer according to the package directions and let it set in the fridge until firm (by jell-o standards that is). 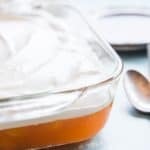 Then you make a lemon jell-o and dissolve marshmallows, cream cheese, and Miracle Whip in it before adding some crushed pineapple and carefully pouring it over the lime layer. Then it goes back in the fridge until that layer is set. 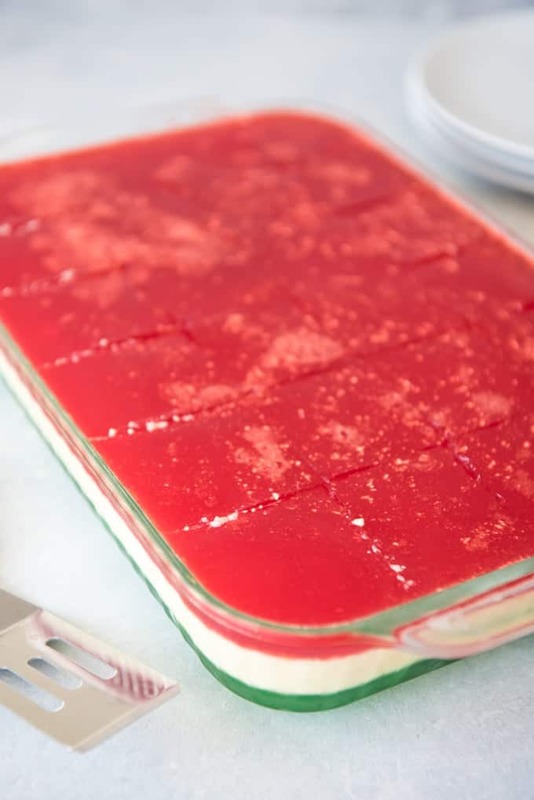 Lastly, you prepare a package of cherry jell-o and carefully pour that over the middle layer and refrigerate the whole thing until firm and ta-da! 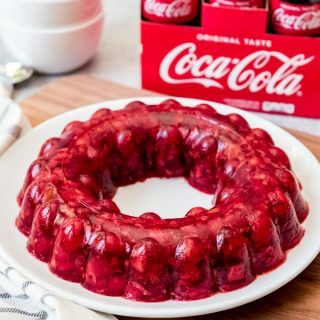 you have a wonderful, festive Jell-O perfect for Christmas dinner! There's always room for Jell-O, especially one as festive and fun as this Triple Layer Vintage Christmas Jell-O Salad with red, white and green layers that are perfect for Christmas dinner! Prepare lime jello according to package directions. 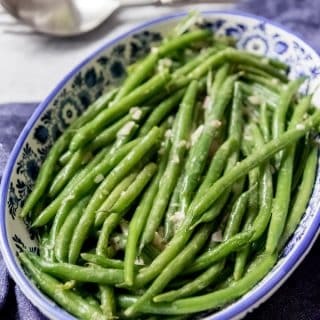 Pour into a 9x13" glass baking dish or individual serving dishes (filling each only 1/3 of the way full) and refrigerate until set. Prepare the lemon jello by adding the powdered gelatin to one cup of boiling water and stirring to dissolve. Add marshmallows and stir until they dissolve as well, whisking if necessary. Whisk in the cream cheese and Miracle Whip, breaking up any clumps of cream cheese, until incorporated. Stir in the drained pineapple, then carefully pour over the set lime layer and return the jello to the refrigerate to set. Once the middle layer is firm, prepare the cherry jello according to package directions. Carefully pour over the middle layer of jello and return the dish to the refrigerator to set completely. Cut into squares and serve. Hmm, I remember a jello salad which goes something like 1 carton cool whip, 1 carton cottage cheese, 1 package any flavor jell-o and 1 can drained crushed pineapple. You mix that all together and let it sit in the fridge for a few hours. I don’t know what it’s called but it was always a family reunion favorite. Is that what you are thinking, Sharon? Stir all together and chill. This is delicious and different. This sounds so good! I need to try it! What is cool whip What would we use in Britain? I think you mean Miracle Whip, Isobel. It’s basically mayonnaise and that would be a totally acceptable substitute. Can you sub sour cream for the Miracle Whip? Yes, although it’s not a perfect substitution. 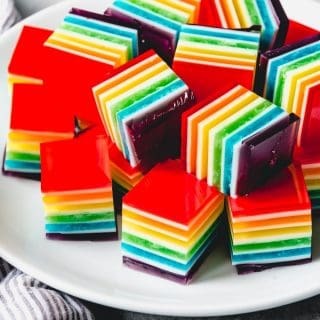 The flavor would be more subtle and mild and I really do love the tangy, boldness of the Miracle Whip in this jello to offset the sweetness. 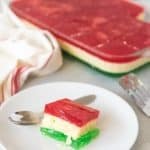 I just adore vintage jello salads! They are always so pretty and taste amazing! What would life have been like without Jello? I had so many Jello molds. The snobs had their aspic. We poorer folk had all the Jello salads and Jello desserts we could want. Never apologize for liking Jello. I love that it’s a family tradition. Love the pretty colors! 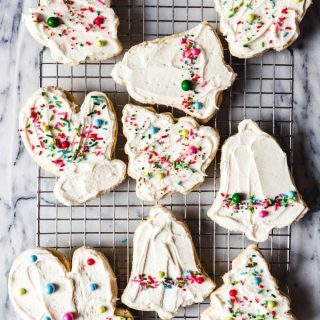 Perfect for holiday parties right now. 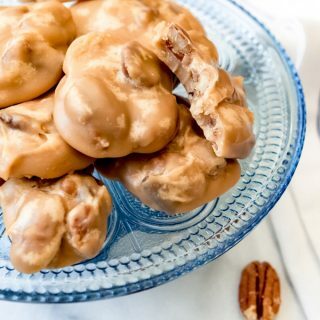 This recipe would be such a hit! 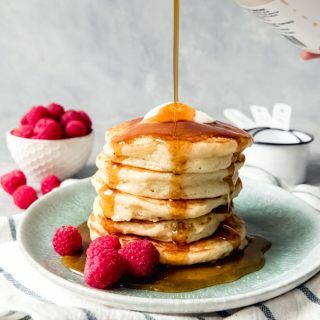 Could i make this a day ahead of when i plan to serve it ? My family used to make a jello mold with strawberry jello then a green layer with made with lime and pineapple juice. This brings back so many memories and looks delicious! 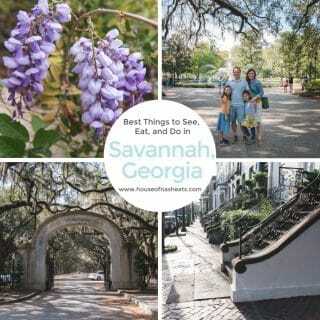 This looks so inviting, and fun to try! Looking forward to testing out this recipe. 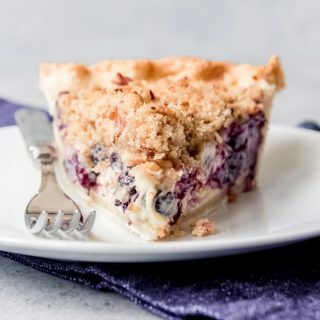 Hi , I love this recipe. It looks amazing, I am gonna surely try it. I used watermelon jello and blueberry pomegranate jello for the jello layers. For the fluff layer, I used lime jello, omitted the pineapple, and substituted cool whip for the mayonnaise (Miracle Whip) and it was delicious. Would be great that way for Thanksgiving or Christmas. 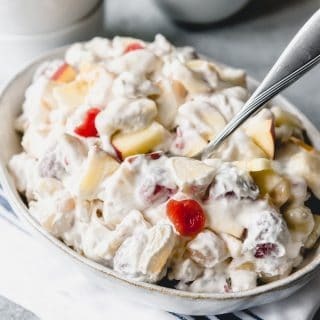 My family loves jello salads, but didn’t like the flavor with the mayo, or the texture of the pineapple, so this new version was a hit with everyone!!! What a great variation! I’m going to have to try this combo!